Cool picture, and I don’t mean the snow. I was wondering how much snow you got in the big storm. 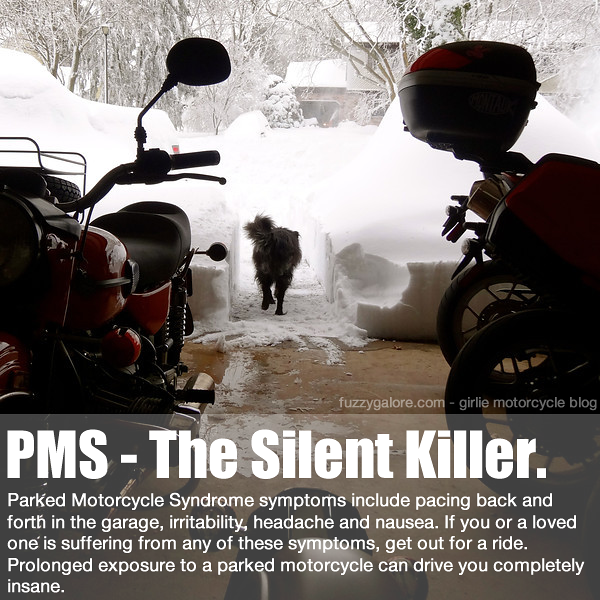 Are you sore from shoveling yet, or just have an itchy throttle hand? We have a very mighty snowblower that does the heavy lifting. Shoveling, thankfully, is kept to a minimum these days! Isn’t that awesome? 🙂 Someday I hope to not be too chicken to do something like that. The snow is sometimes a good thing for anyone who has maintenance to catch up on. Of course it does make me lazy with my maintenance, if it was warm out I probably would have finished already! My Abarth is peppy, cute and handles better than a car should. Plus, I get stopped almost every day by people wanting to compliment it. Last night, an old man told me a lengthy tale about the 1968 Fiat 800 he had with custom Abarth parts. Yes, I’m conscious this is a motorcycle blog so I won’t prattle on any more about a cage, but there is a connection — Carlo Abarth (for whom my car is named) was a motorcycle racer before he started making little Fiats go faster. Even cooler, related to you Fuzzy, Carlo once famously raced a train with his sidecar bike and won!